Banking is necessary, but banks are not,” Bill Gates, co-founder of Microsoft Corp., had said over two decades ago. While physical banks may still be around, online banking, mobile banking, artificial intelligence-powered chatbots and voice bots, banking on social media sites, fintechs, payment banks, and open banking initiatives are radically transforming the sector. Open banking, according to Accenture, is an emerging model that allows customers to share access to their financial data with non-banking third parties, such as retailers or fintech companies, which can then use that data to provide customers with better banking experience. However, as data analytics becomes increasingly important for banks to extend their omnichannel reach, there is simultaneously the pressing need to protect consumer privacy, ensure transparency of transactions and prevent security breaches to avoid scams in a digital world. It is in this context that blockchain, the technology that powers cryptocurrencies such as the volatile bitcoin, may provide credible solutions to financial institutions across the world. In early August, the World Bank mandated the Commonwealth Bank of Australia to arrange the world’s first blockchain bond. The Kangaroo bond, referring to foreign bonds issued in Australia in local currency, is named bond-i. Grupo Santander, the largest Spanish banking group controlled by the Banco Group, has implemented a One Pay FX payment system running on blockchain. It is primarily aimed at optimizing payments between Europe and South America with the use of distributed ledgers. The People’s Bank of China officially launched the testing phase of a blockchain trade finance platform, local news outlet Shanghai Securities News reported on 4 September (bit.ly/2wEaueM). Similarly, Samsung SDS, a subsidiary of South Korea’s tech conglomerate, announced in August that it has developed a blockchain-based certification platform for South Korean banks. South African Reserve Bank, too, has launched Project Khokha to test DLT (distributed ledger technology) initiatives that comply with payment regulators. Microsoft struck a deal last September with Israel’s largest bank, Bank Hapoalim, to create a digital bank guarantee based on blockchain. Similarly, International Business Machines Corp. (IBM), launched its first commercial blockchain deployment for the private equity market last February in collaboration with Northern Trust Corp.
Closer home, banks have formed “BankChain”—an alliance formed in February 2017 to explore and build blockchain-based solutions. The BankChain community has 37 members, with representations from 28 Indian banks including State Bank of India, ICICI Bank Ltd, Kotak Mahindra Bank Ltd, HDFC Bank Ltd and Yes Bank Ltd.
Over the last 18 months, the BankChain alliance has helped banks address issues such as setting up of an integrated corporate eKYC (electronic-know your customer) platform, vendor rating and a blockchain-powered register that records hypothecation, lien, mortgage, pledge, etc., on movable, immovable and intangible assets. 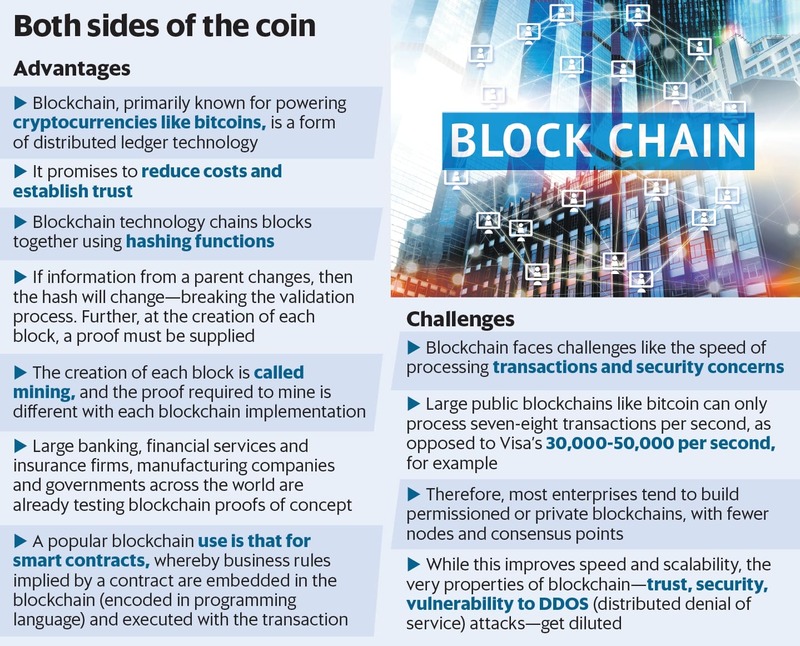 These include cross-border remittances, corporate KYC and charge registry, bank guarantees and employee background verification, according to Rohas Nagpal, chief blockchain architect of Primechain Technologies Pvt. Ltd, the Pune-based start-up that operates BankChain. The country’s apex banking regulator appears to be favouring the use of blockchain in specific cases. In a November 2017 white paper, the Institute for Development and Research in Banking Technology, established by the Reserve Bank of India, had recommended that banks could set up a “private blockchain for their internal purposes”. The paper pointed out, among other things, that “…besides eliminating the need for moving paper across countries, the transaction eliminates the need for financial messaging between banks and introduces the convenience of instant cross-border remittances for retail customers”. While “blockchains may not change the face of banking, it will provide opportunities to fintech start-ups”, says Sudin Baraokar, adviser to financial institutions and fintechs. He insists, however, that there is an urgent need for regulatory authorities “to set up an ecosystem for API (application programming interface) interoperability and a regulatory sandbox to help participating banks validate their blockchain solutions, else, everything will just be theory”. Globally, governments are already betting on blockchain’s potential. The Monetary Authority of Singapore, the city-state’s de facto central bank, spoke of blockchain’s potential in international payments this March. In April, the United Arab Emirates government launched the Emirates Blockchain Strategy 2021 (bit.ly/2OSxz5S), which aims to leverage the technology to transform 50% of government transactions on the blockchain platform within the next three years. By adopting this technology, the UAE government expects to save 11 billion UAE dirhams in transactions and documents processed routinely, and 398 million printed documents and 77 million work hours annually. Nagpal of Primechain, on his part, says that blockchain Web services like the electronic signature engine does not need regulatory approval. “The actual document to be signed or verified does not need to be transmitted. Only the hash needs to be transmitted for signature generation and verification,” he says. The tipping point though, according to Baraokar, is planning to make “more exchanges for tokenization and cryptocurrency”. This, according to him, will also popularize the concept of the so-called Stable Coin, or cryptocurrencies that are meant to hold stable values. For example, Tether or TrueUSD hold actual dollars in reserve that are redeemable for the token. Others such as Dai hold crypto-assets in reserve and have a lending system. Similarly, a new project for a US dollar-pegged stable coin that runs on the Stellar blockchain network has received backing from IBM, Reuters reported on 17 July. Having emerged from the shadows of the volatile bitcoin, blockchain is now swinging to the other side of the pendulum and is being positioned as a cure for all banking ills. It does, however, have its Achilles heel. Blockchain consumers, for instance, are often the easiest targets—due to a start-up mentality, in which security takes a back seat to growth, according to a June 2018 McAfee report. Without a clear understanding of where the risks are, you may place undue trust in your blockchain implementations, the report adds.